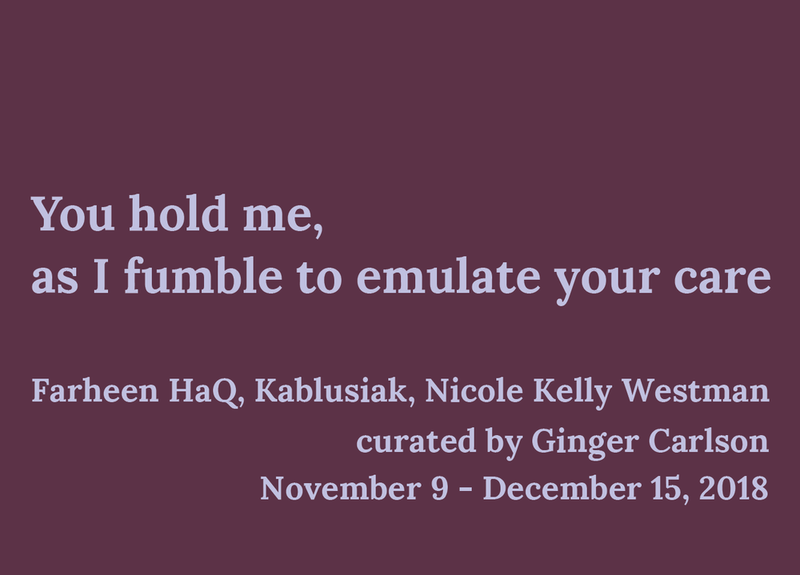 You hold me, as I fumble to emulate your care includes new work by Farheen HaQ, Kablusiak, and Nicole Kelly Westman, which speaks to the complexities of care, intimacy, vulnerability, and relationality through the lens of mothering. Curated by Ginger Carlson. our hearts persist in excess of the justice they’re refused. I start here, so that you might know the breadth of my emulations. I fumble to emulate your care, and those of all the others that make up a body that labours and learns and fails and adapts. A plenitude of mothers, a multitude. A complexity that may evoke a categorization, and yes, can be sameness, but yet, it also resists these devices and vibrates perceptibly in difference. The mothering of and by and from alterity is a shifting relationality, a verbing, a dialogic, a subjectivity - it encompasses a way of thinking and an ethics of temporality. Mothering is a continuous separation and a becoming that is enacted. I mirror your voice. I inherit a mother tongue and I speak it to you. An acquisition of language is doubled by an acquisition of ethics, of listening, of reciprocity. But what if this language is not ours, really? When you find your language, is that a way of mothering too? Mothering your insides – your mind, your heart, your spirit, your lungs, your esophagus, your tongue, your very breath as it escapes. Is this an acquisition that is more your own? Mother of, a script that might also be read as Singer of. A little closer to your breath and the vibrations of your body. Singer of your longing for language, your longing for home, your longing for closeness to those pieces of you that are far away and missing. A mothering that longs for you to know yourself better than the horizon knows the ocean; which is a touching, a grasping, but a dearth of distance nevertheless. And sometimes these things really are only for you. You render them visible yet opaque by articulating their outlines. Their insides are not for everyone to know, and you learn their shapes better by pushing them out of your mouth. Some gaps were there already, but others you put there intentionally, a way of protecting through omission, a way of mothering. Someday you might fill in the lines, or maybe you won’t. I lean into you. The clothes that I wear hold the shape of you too. We sink sublimely into each other and balance each other’s weights and burdens. This is an emulation that we both share, and I find myself searching for mothers in every posture, every desire, every action in the pursuit of generosity and justice, of occupying space, of holding space, of giving it up. Your labours here are not forgotten. You mothered tenacity and honesty, empathy and generosity in me. In the pursuit of carving out space you encountered derision and this mothered in me an awareness of the facets of patriarchy and the mechanics of authority. Your labours here are not forgotten, they are echoed. Refracting in my actions like reflected light, they create a colour spectrum. And what about the open road? What about those open spaces do you find so appealing? Is it because she was there too, long before you, and she paved the way? Is it the journey or the destination, the spaces in between, where you start or where you end up, or is it the road itself that mothers you? I struggle with the weight of you. The circuitous route that you took to find your body helped me find my body too. One hundred and forty pounds of plenitude and nourishment that you shared with me. A sharing, an occupying, a heavy feeling around my insides – it is a kind of mothering. Over time it becomes a way of reconstituting. Constituting self with other, a fabric of knowing that is embodied and laboured upon. Inside my body, a multitude of bodies. And they are made up of care, of hospitality. A radical precondition for ethics; an unconditional welcoming, untethered from those modes of thinking that commodify and categorize. This is a kind of mothering too, and it is a labour also. A materiality of labour: you give form to it, exteriorize it, offer up an outer economics of it. It feels insistent, and so you articulate it. You carry one hundred and forty pounds of it. Let’s return again to insides. My insides feel knotted sometimes. You pour yourself out and the cup overflows and I almost drown in it. La mer, the sea, the mother - there is a drowning in mothering too. A fumbling, a floundering, a loss, a filling up and a pouring out. A kind of dying, a kind of offering, a kind of wet closeness to your organs, a kind of breaking them apart. And here is where I turn to your hands. A mirroring that pushes outwards against its narrow framing, and lets a multiplicity of mothers in. To emulate, to receive, to reciprocate, to return. The many-gendered many-othered many mothers of my heart begin here, in your hands. You hold me, I hold you. Ginger Carlson is the Executive Director of TRUCK. Previously, she was the Director of Untitled Art Society (2013 - 2016) and the Visual Arts Curator for the Sled Island Music and Arts Festival in Calgary (2015 - 2017). She sits on the Board of Directors for the Artist-Run Centres and Collectives Conference, M:ST Performative Art Festival and is the acting Vice-President of the Alberta Association of Artist-run Centres. She has written essays and reviews for BlackFlash Magazine, Canadian Art, Luma Film and Media Art Quarterly, and SNAPline. In 2016, she received the Canadian Art Foundation Writing Prize. Kablusiak is an Inuvialuk artist and curator based in Alberta and holds a BFA in Drawing from the Alberta College of Art and Design. They recently completed the Indigenous Curatorial Research Practicum at Banff Centre for Arts and Creativity. Kablusiak uses art and humour as a coping mechanism to address cultural displacement. The lighthearted nature of their practice extends gestures of empathy and solidarity; these interests invite a reconsideration of the perceptions of contemporary Indigeneity.